Auntie M is huge fan of Tana French’s novels set in Ireland, starting with Into the Woods, followed by The Likeness and the stunning Faithful Place. 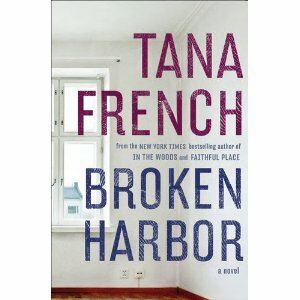 Now she’s back with Broken Harbor, and her novels get stronger and more compelling with each offering. In a recent essay on craft, French described her husband not allowing her to use dream sequences in her novels too much. She doesn’t need dreams; the world she creates is startling enough. Mick Kennedy is a a top Murder Squad detective who’s earned the nickname “Scorcher” for his devotion to the job and its victims. He lands a tragic but high profile murder case on the half-deserted development now called Brianstown, one of the many high-end neighborhoods that have fallen with the down-turned economy, leaving their few owners to cope with shoddy construction and broken promises. Mick brings along his new partner, Richie, a rookie detective on his first case, thrilled to learn from the master. But before it was Brianstown, the area was known as Broken Harbor, and Mick has his own disturbing and poignant memories of the area that will haunt him almost as much as the scene they find. Patrick Spain is dead; his wife, Jenny, lies in intensive care. Their blood splatters the downstairs kitchen area. Upstairs, the Spain’s young son and daughter are found dead in their beds. The scene is shocking and disturbing. What appears to be an easy case to solve quickly proves to be one of the most tangled and difficult of Mick’s career. There are unexplained things in the house: smashed holes in walls, with baby monitor cameras pointing at them; files have been erased from the Spain’s computer. And then Jenny’s sister Fiona tells the detectives her sister has been afraid of an intruder who slipped past their locks and alarms and helped himself to food from their refrigerator. As he juggles teaching Richie about true detecting and not jumping to conclusions, Mick’s life is complicated by his younger sister, Dina. Her mental illness escalates and barges into his life and his thoughts, bringing back the memories of his family’s last summer at Broken Harbor. Adding to the layers are Mick’s new relationship with Richie. Partnerships are built on trust. But he doesn’t know Richie well enough to trust him–yet. French’s sense of setting is acute; she brings all the senses to her descriptions and adds nuances that fill the atmosphere of the book with power and emotion. This is as gripping a novel as Auntie M has read this year, a mix of French’s usual police procedural and psychological thriller, created with realistic characters and situations, plot lines that weave and warp, and with a sense of setting so powerful you will feel as if you’ve been to Broken Harbor.